The author does not hide it. 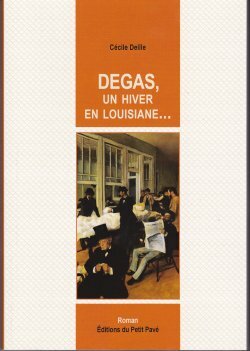 This is a novel but so close to reality that we accompany Degas at each step of his journey to Louisiana during the winter 1872-1873. I shared this reality without going to New Orleans! That is to say that Cécile Delile, the author, has just come into her subject and she manages to share with us her passion for the painter but also, to a certain extent, for the character. Why did you choose to write this - unexpected - book about Degas' trip to Louisiana? This is obviously the first question that comes to mind because the subjects are not lacking around the work and the personality of Degas. "I found a woman in Louisiana", says the author in a long and exciting conversation. Difficult to convince the reader when we know the life of Degas, surrounded by women who were more beautiful and more attractive than each other. The author says ONE woman and not WOMEN. And this woman is Estelle, his first cousin, the wife of René, his beloved brother... at the time! The whole book finally turns around this affective relationship, this incarnation of the - psychological - beauty of the woman Degas seems to discover as soon as he arrives at New Orleans. He had met his cousin in Paris long before. She had married her brother René and no doubt that this is what drove Degas to undertake this long journey. "Degas is attracted to her, physically and intellectually just as he will be by Berthe Morisot later," says the author. Attracted too, and perhaps most importantly, by his family. We will remember the trip he made to Naples to meet his family and one of the major results is the sumptuous painting the Famille Bellelli of the Orsay Museum in Paris and whose Copenhagen Museum has a less successful version. "I wanted to keep a part of the dream", adds the author, a dream nevertheless based on the correspondence of Degas which Cécile Delile clearly used as well as Degas par lui-même by Richard Kendall. We follow Degas on the boat on his arrival at New York and his journey to New Orleans. The train, the boat on the Mississippi, the "vertical landscapes" of the big cities he crossed and the lazy slowness of the majestic river. "Accompanied" by the Confessions by Jean-Jacques Rousseau, Degas discovers a new world. However, he continues to observe it through painting and literature. This is how he transposes "his" Parisian world, probably a way to better withstand a distance that ultimately weighs him down. Paris, the Opera, its streets... But, in New Orleans, he discovers new scents, a new light, unknown rustling and... people with colors and colorful clothes. "Power of the white and the light. Freshness of the houses, one hides inside and one lives on the step of the door", he writes in his Carnet n ° 4. He continues to paint: two versions of the Bureau de coton including that of the Pau Museum in the south of France, Femme à la potiche (Estelle Musson, wife of his brother René) of the Orsay Museum, Achille de Gas and several other portraits of his family and of his relatives. Between portraits and interiors, he left aside exterior scenes yet so shimmering but, here as in Paris, the landscape did not attract him much. And yet, the Mississippi could have... At one moment, one feels that he hesitated to return to Paris. No doubt Estelle! But the Parisian cultural scene is too strong to resist and in March 1873, the boat that goes through Cuba brings him back to France. Where he finds his habits, his friends and Durand-Ruel to which he tries to sell more and more paintings. With this book, this short part of Degas' life becomes important. Degas is drawn far from its walls and habits which strengthen the curious relations he had with his cousin Estelle. This is the whole point of the novel.